Discussion in 'Builds and Fabricators Forum' started by ITLKSEZ, Aug 20, 2015. 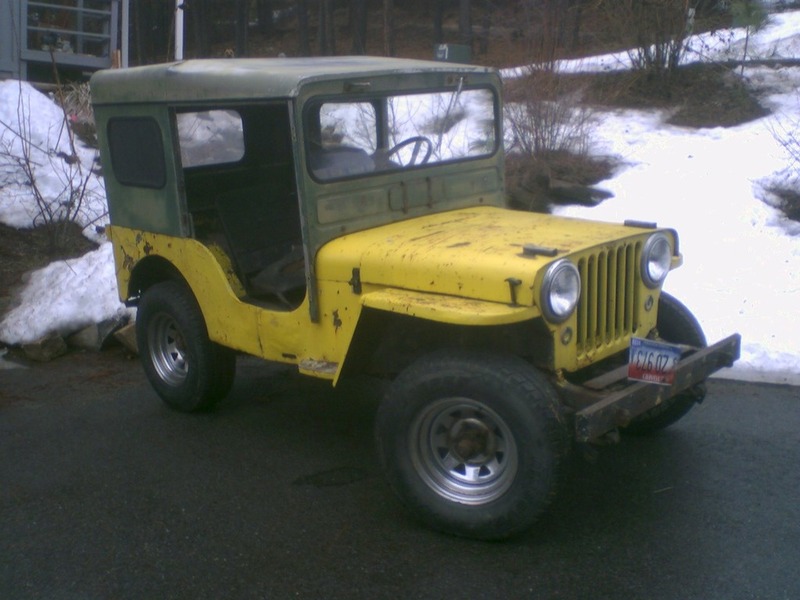 Those of you who saw my intro know some of my history with jeeps. In that intro, I dropped a hint about my wife's 3A that I am planning on adapting a Volvo four-cylinder engine and 4 speed to a Dana 300. Well, here is its story. 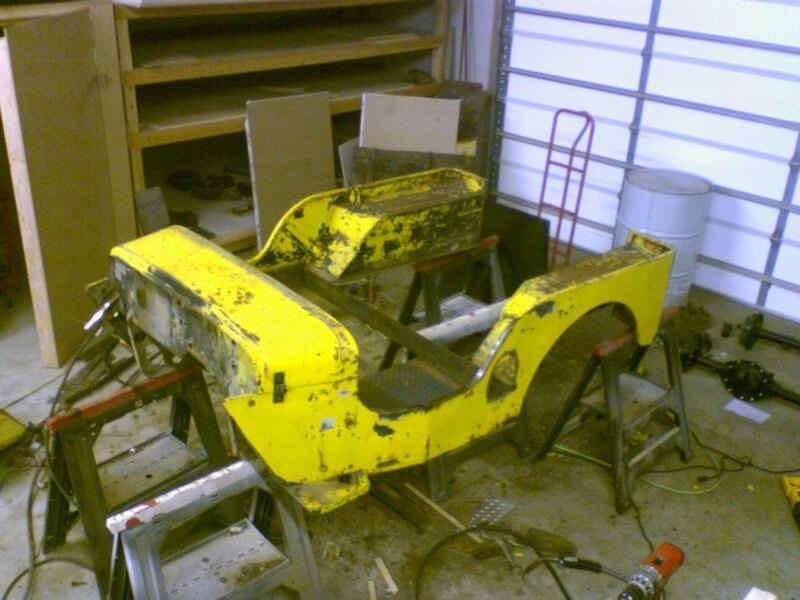 It has sat untouched in my shop for about 6 years due to lack of "allocated funds." I am posting this progress report as sort of a motivator to myself more than anything. I forget how much time I have into this already, and I've barely began. It started as a supposed good deal on CL, but I broke the one major cardinal rule: don't look at/buy a jeep in the dark. My initial plan was to get it running, fix the seats, throw some tags on it and take the kids for ice cream on the weekends. Then the sun rose the next morning, and I saw the real condition of the body. My flashlight lied! I started to peel bondo away to show the true condition of the body and it wasn't good. I talked it over with my wife, and we decided to do it right. I'd strip it down and replace what needed to be replaced. And if I was going that far, why not make it a super-reliable, comfortable daily driver, as well as a capable, mild off-roader? And so It began. As a disclaimer, I didn't take my time on this bodywork to avoid warps and imperfections like I could have; It is going to get Rhino Lined inside and out. I didn't think it was justifiable to spend the extra time on perfection. It's just going to get beat up anyway! 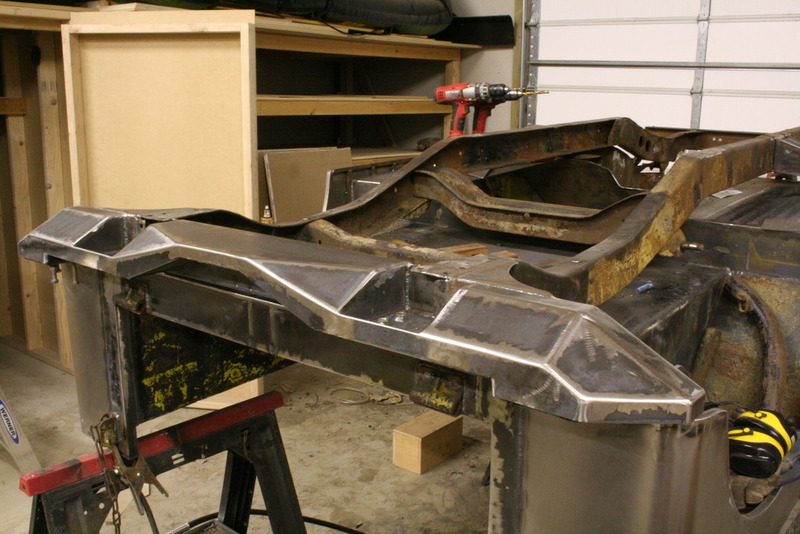 I carried the body into the shop and started cutting and patching. The sides would splay out when you unlatched the tailgate. I had to totally cut out and rebuild the framework around it. 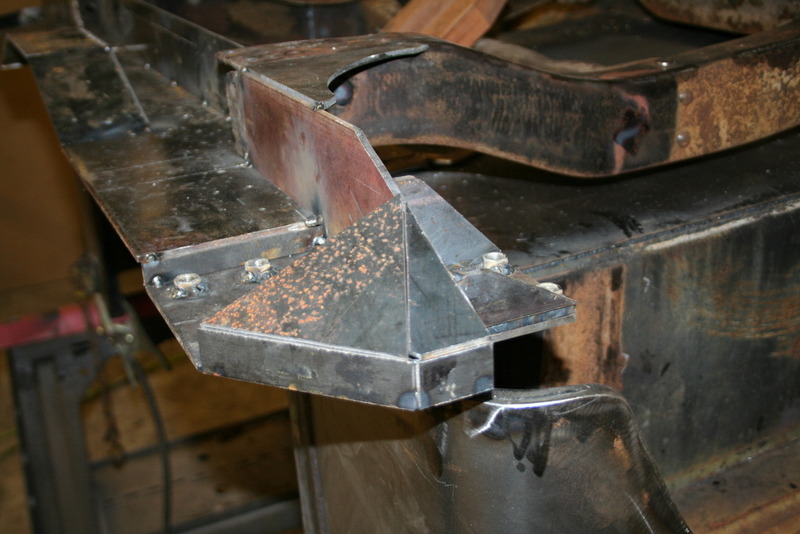 I cut the rotted sections out of the sides and formed a new bottom edge out of 1/2" square tubing. 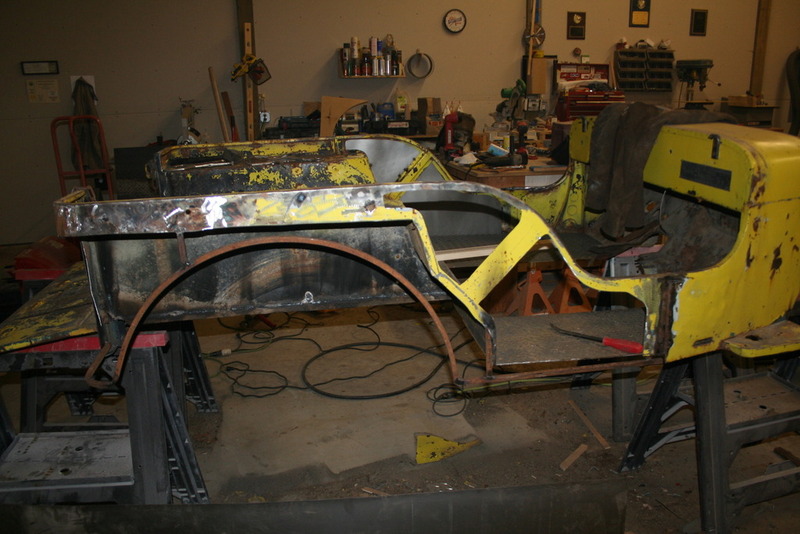 To get a little more street-ability out of it, I moved the rear wheel opening rearward 3" for a longer wheelbase. 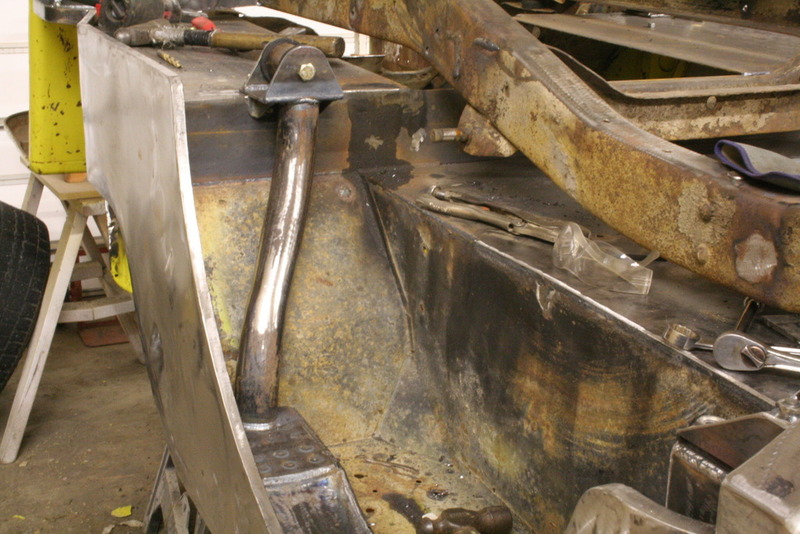 The rear shackle mounts will be hung from the rear bumper... You'll see that in a minute. 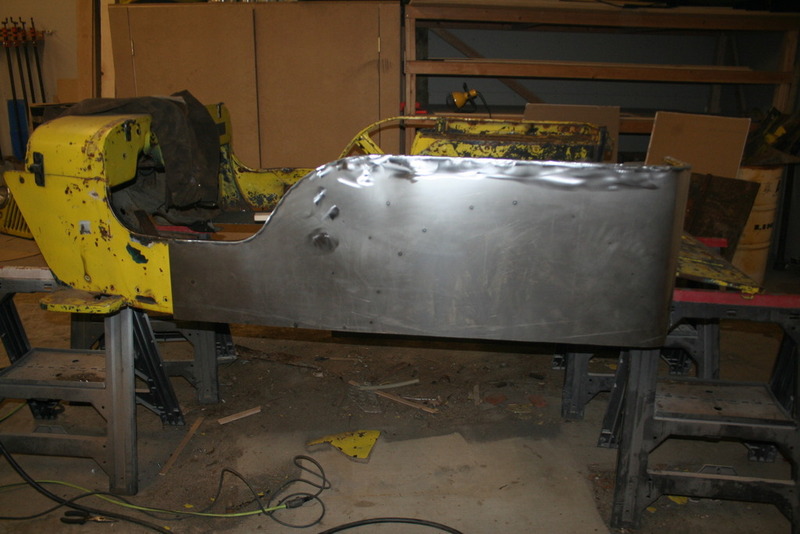 I made the fender fins out of 1/8" steel, to truly make them steps. I flipped it over and put the frame on it to start tying the body into the frame. 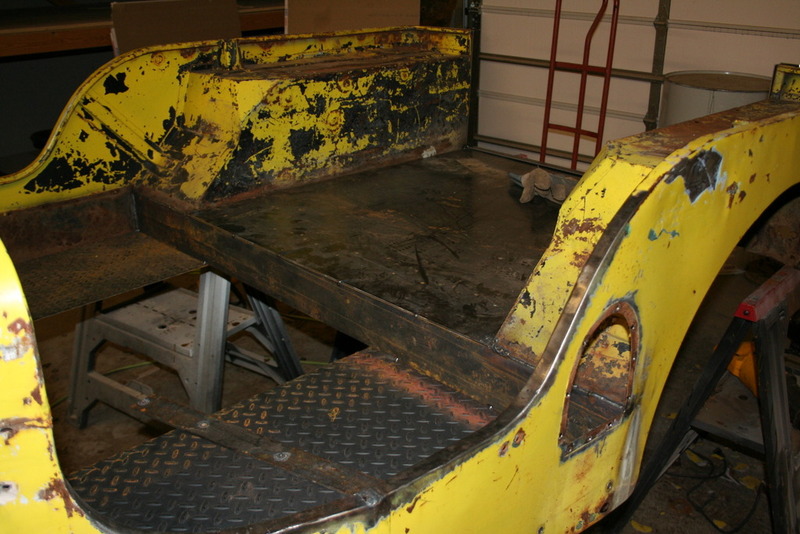 My plan is to make the roll cage and mounts double as body mounts and have everything mount on isolated rubber mounts. This will completely tie the cage to the frame and make everything solid but cushioned. 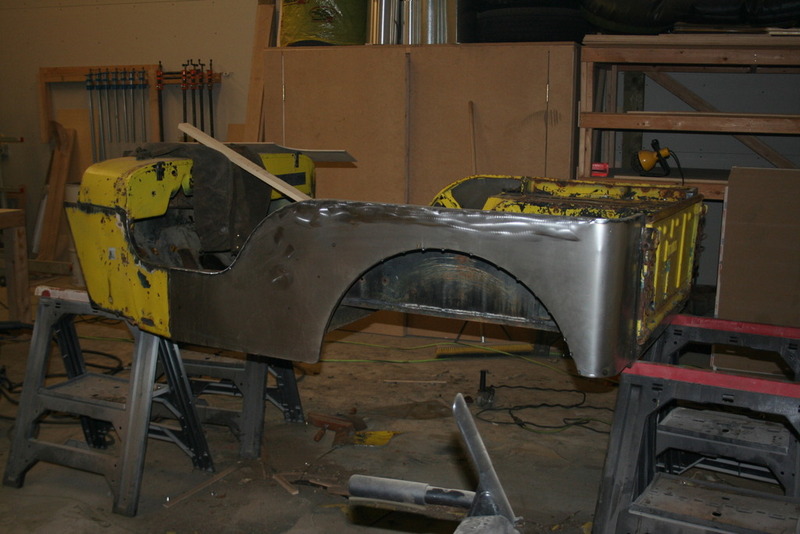 My work started at the rear bumper that will house the rear shackles, the swing-out tire carrier and the rear cage/body mounts. Many hours were spent behind the bandsaw. 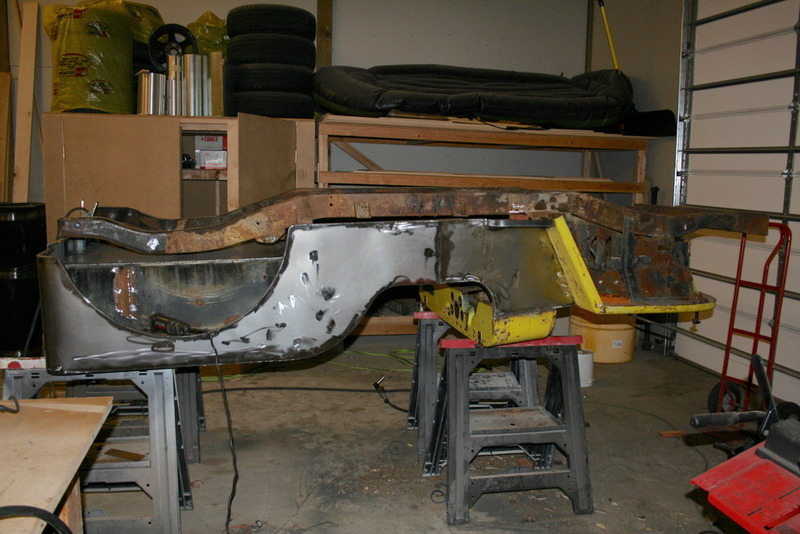 The cage tie-in was complicated in the rear, as I had to make a subframe in the wheel well to support the body and incorporate cage mounts. 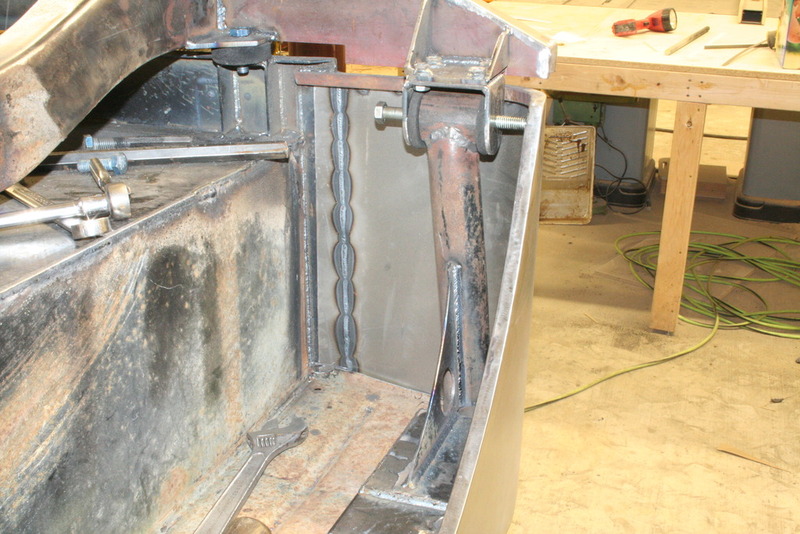 Every point of connection has nuts welded to the inside for easy install/removal. 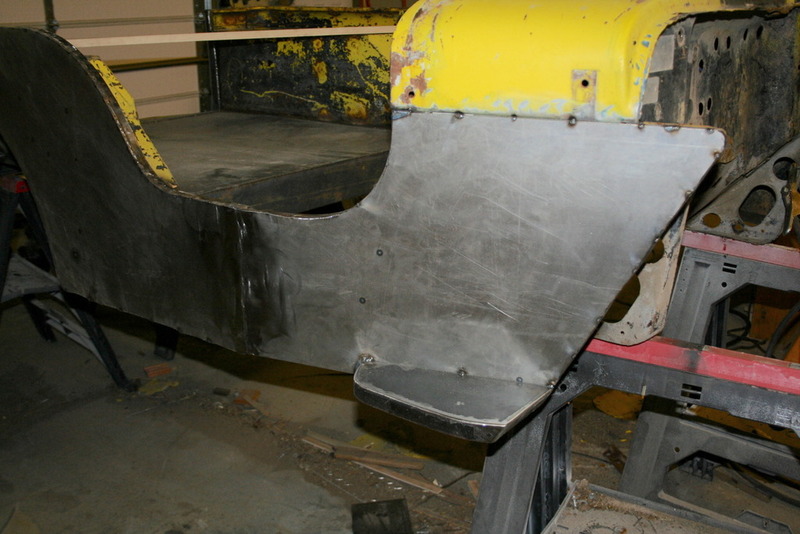 I have the under-seat cage mounts completed, but don't have any pics of that for some reason. Otherwise, that is the stage at which it is at now. 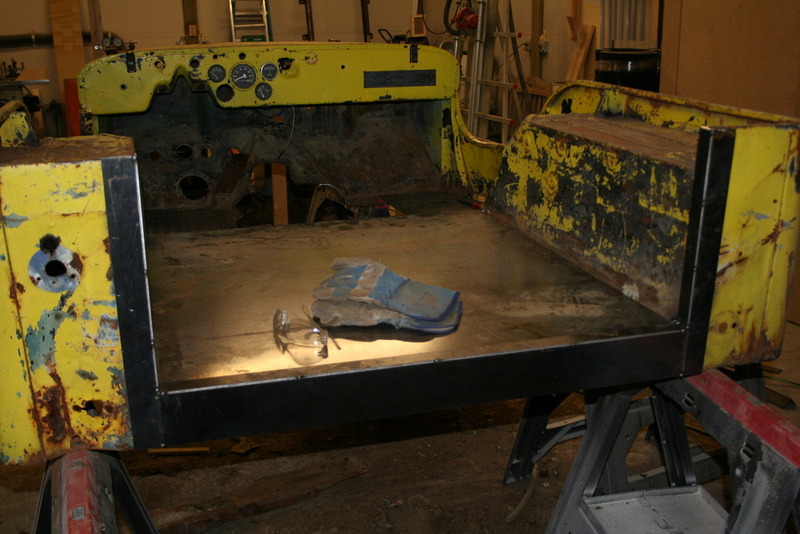 The body is up on-end on a trolly in the corner of my shop, and the frame is propped up in another corner. I'm afraid with my upcoming adventure, it is going to get pushed even further back on my list of priorities, but at least this thread is started for when I do. 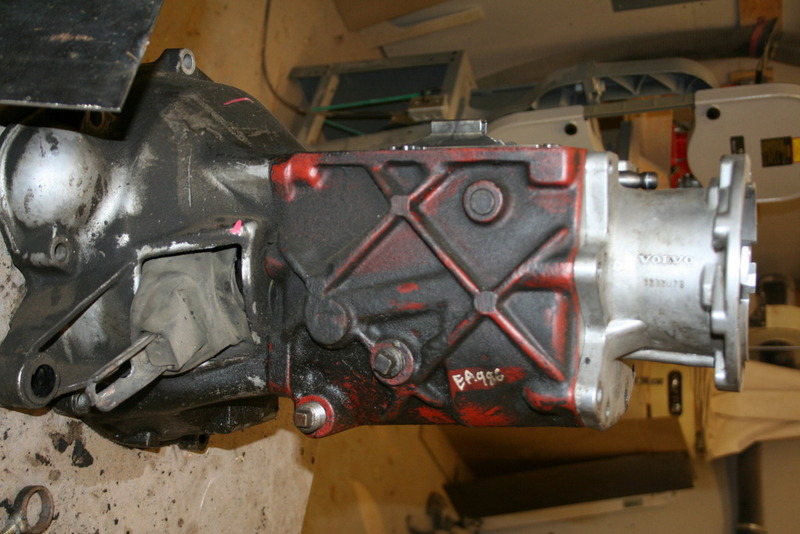 Here is the Volvo transmission I plan on using and adapting to the Dana 300. Questions and comments (and donations) are welcome! 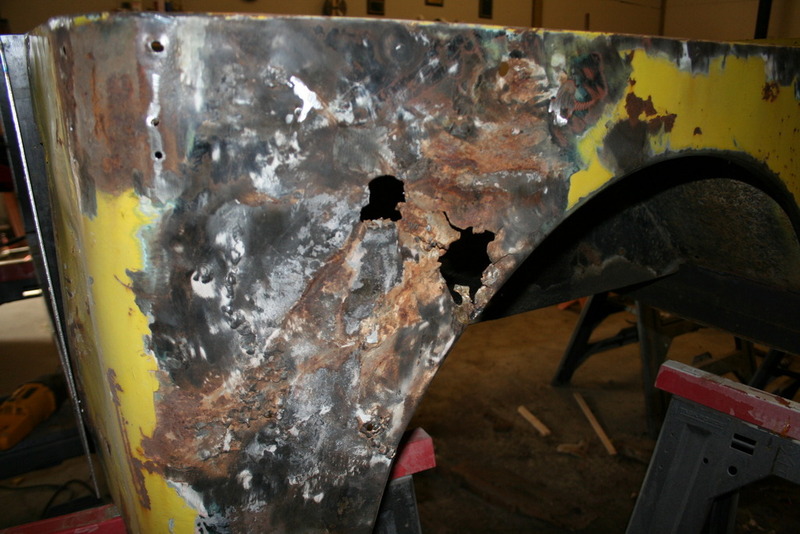 It's obvious you can weld and seem to have a good plan inmind. I'm interested about your use of Volvo parts. I have thought of that for many years. It's very common for Jeeps in Europe to run Volvo parts. Depending on the car, a Volvo could have a few desirable parts. some had a York AC unit for an on board air compressor, fairly indestructable transmissions, the rear axle in the older ones were basicly a D44 with disk brakes. I'm going to watch your build. I'm a jeep guy first, but the Volvo blood runs deep. I've owned a '79 242GT (750K miles), an '82 240GLT wagon (500K miles), and currently a '95 850GLT wagon (400K miles). Oh, and my wife's '01 V70T5, but I never get to drive that. I had the head off the 850 at 300K to replace a burnt valve (my stupid fault, long story) and the cylinders still had the hone marks from the factory!!! I bought it from a friend of a friend, and I know for a fact that that car has never been apart. The old red block 4cyl drivetrains are even more robust. Built like a truck. 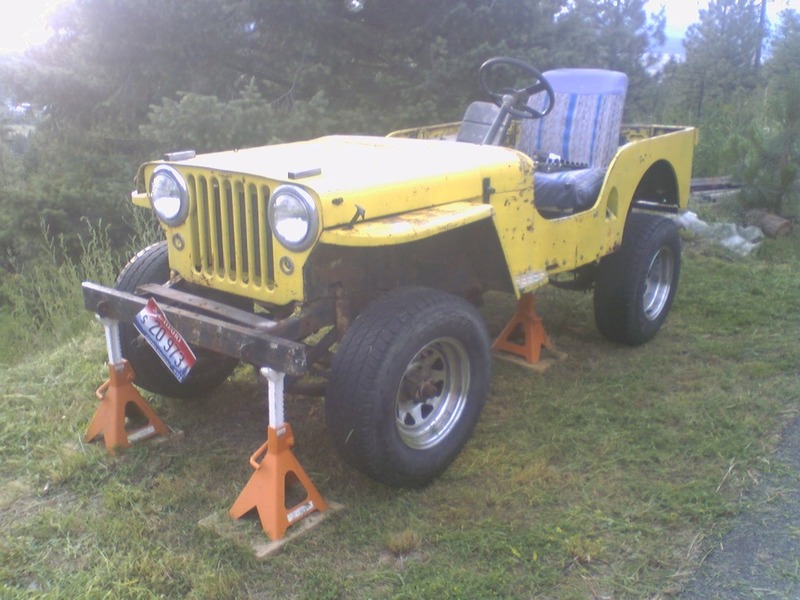 Absolutely perfect drivetrains for a jeep. Plenty of power (compared to the 134), mechanical fuel distribution, tried and true points-style distributor, turbo if you want it.... And yes the rear axles are Danas. The 240s used a ring and pinion from a Dana 30 with 27 spline axles, but had different, massive housings with multilink mounts cast in. Full posi and locker options from the jeep crowd are also available for Volvos, as well as options from the factory. I'm still on the fence about using a Volvo rear axle in this build. I'm tempted, just to be different. The width is perfect with wheel adapters, and they are a dime a dozen at the you-pull-it yard. The axle shafts are insanely huge. I was doing a wheel bearing job on my '79 once at my parents', and my dad just happened to be doing a brake job on his 2-ton IH dump truck at the same time. I took my Volvo shaft over to compare. The Volvo's splined section was smaller, but the rest of the shaft dwarfed the truck's axle. To be fair, it's a semi-float vs. full float, but still impressive. I have got to say that is some great metal work ! I to will be watching the build . We will have to swap Volvo storys some time. Every one I owned ran when it went away, if it had a motor. The ol' 86 240 is still my DD and only has a bit over 200 K on it. I think this is number six. Thanks, chris423. I have more time than money, so sitting in front of a bandsaw and welder all night is a more feasible option than buying pre-made parts. 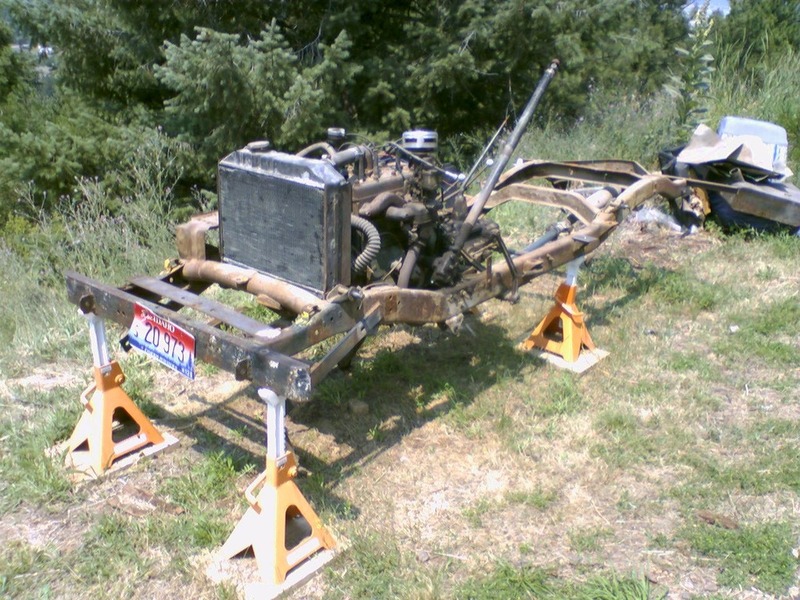 Now I'm at a point where I need springs, axles and a donor Volvo (for the engine and wiring) to move forward, and I haven't been able find the ones I want for free... My tubing bender is coming back with me from PA next week, so that will be a big help. I've read up on your build too. Keep up the good work! Body building can either be relaxing and fun if it is going right, or maddening if not. A fellow Volvo guy! It sounded like you knew a little too much about Volvos! I'll tell ya, I'm a RWD guy through and through. Loved my 2xx's. I bought that 850 only because my buddy knew the people who bought it new and were more interested in it going to a good home than getting big $ for it. He drove it out to me from NJ and I handed him $1000 for it, and he flew home. I expected to get a few thousand miles out of it, but that was back in '06 and 200k miles ago, and that goofy 5cyl is still running strong! I to have more time than money. And body work is fun till I have to bend or get uncomfortable ! Also when I have to cut out what I put in ! Thanks for the compliment. I have a scrape yard near me that sells steal for 40cents a pound . I want to get a shell of a 500 pounder . 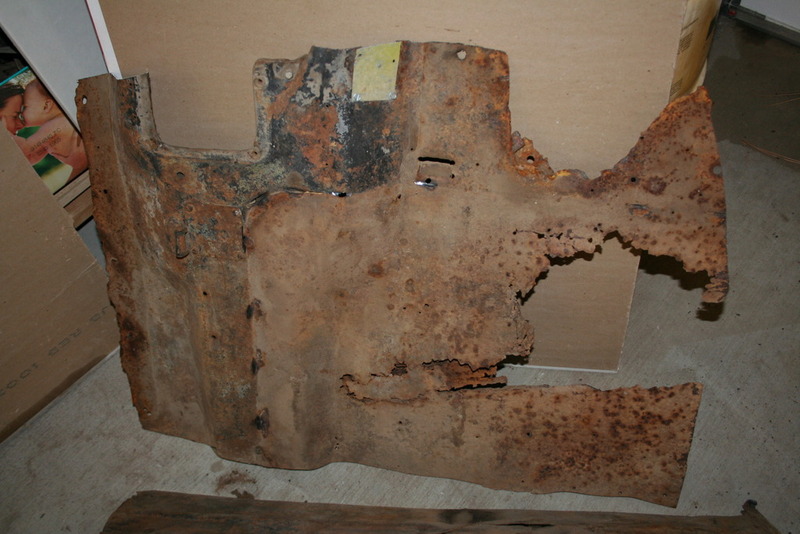 some where near me makes the shells for aircraft bombs . would look great for a xtra tank! I like your use of 1/2x1/2 square tube. i have to cut my rear wheel wells to accommodate my bigger tires. I will use this method. I might not need a real tubing bender to do it either. Your 3a was in bad shape, just about the same as my 2a. Hey guys, what is the difference between a 2a and a 3a? 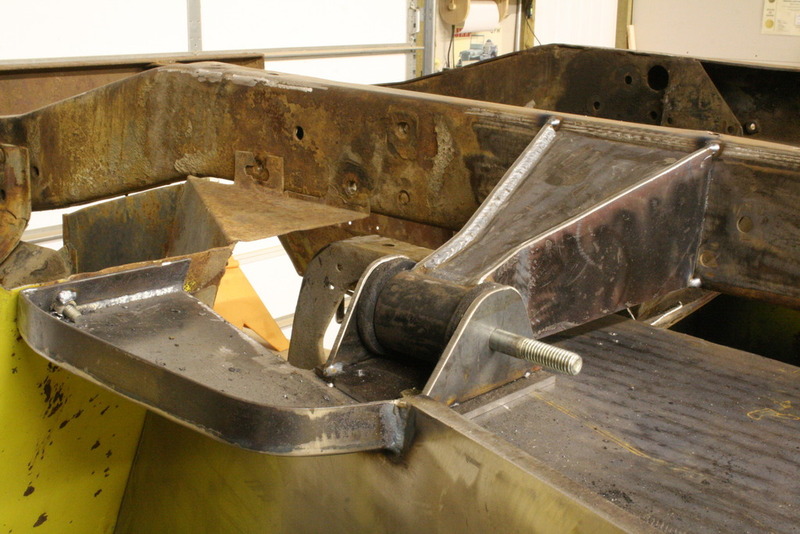 I actually used a 55 gallon drum to bend the arc for the wheel openings. Heh, nothing wrong with a volvo, My Dad put together a '29 Model A Closed Cab pickup for my mother, and it's got the drivetrain pulled out of a '92 740 Turbo, My uncle has worked on volvos for forever, so he came up and cleaned out the harness of everything the little truck didn't need, and rebuilt the looms, mounted the ECU and everything. And did a little "massaging" of the turbo (wastegate and blowoff, I think), and in that little 2400 lb truck, when the turbo kicks in, it's pretty damned impressive how fast it'll get moving. Plus it's fun for them to take it to Rod Runs, and have people try to guess what the hell the engine is, since my Dad and Uncle took the time to make sure to remove any exterior identifying marks..... In the 5 years it's been together and gone to rod runs, they've had exactly 1 guy guess what it was. Volvos have been good to me. I think I got my first in 1981. Been up on trails and came home with the exhaust pipe strapped to the roof rack. I laugh at some of the auto ads on TV. "Up to 34 MPG" Ummmm, got that on my last trip to OR. in an '86 with the AC going full blast at 80 MPH. Hows this build going since you got back? I appreciate your interest, but this is on the waaaay back burner. Work in the woodshop has dried up as of late, so I've been forced to get a "real" job, I start tonight. Maybe with the added income I'll be "allowed" to proceed with this over the winter. You'll get updates if there are any. Oooooohh baby!!! Patience pays off. Going to pick up my $200 Craigslist find this weekend! An '87 740GLE for a donor engine. Runs and drives, just needs a water pump. I'll be able to part the rest out and at least break even. I'll still be searching for a turbo version, but this will get me moving on this project again. I dragged this turd home yesterday. Not a single straight body panel, the interior is absolutely trashed, the suspension is shot... But the engine bay is beautiful. 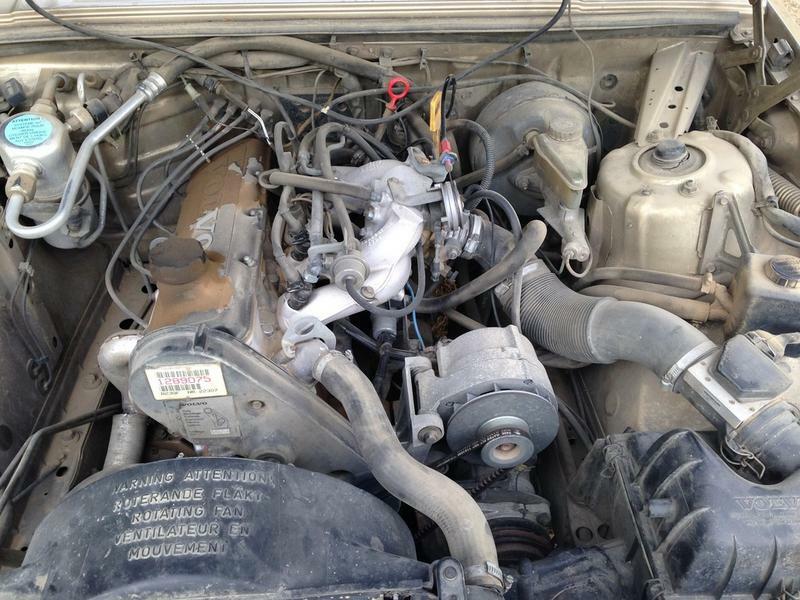 Power steering, power brakes, AC, starts and runs perfectly... I'm excited to get working on this adaptation. The exhaust vs. front driveshaft might be an issue, but we'll cross that bridge when we come to it. Awesome job on the metal work! Ooooh this is gonna look awesome in a flatty! get to work! Can you turbo that thing? In all seriousness, thats going to be cool. In N/A form, that engine makes 116 hp @ 5400 rpm, but a sweet 136 ft. lbs. of torque @ 2750 rpm. Lots of grunt for a little 3A. 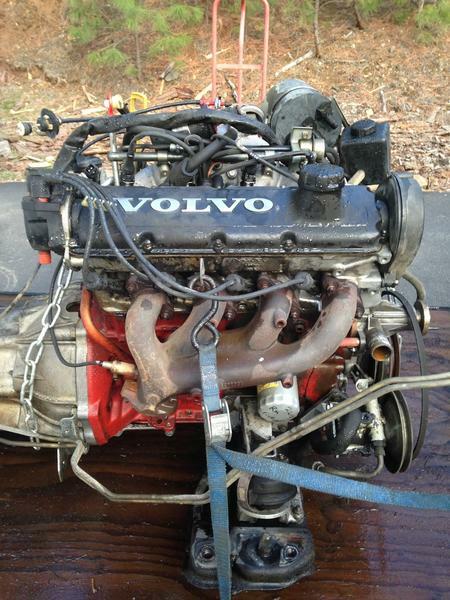 Add the pleasant gearing of the stock (Volvo) four speed, and I think it will be perfect. The turbo version (stock) makes 160 hp @ 5300 rpm and 187 ft. lbs. of torque @ 2900 rpm. They are easily massaged to well over 200 hp, but then the transmissions start exploding. My original plan was to use a turbo engine, and it still might be. 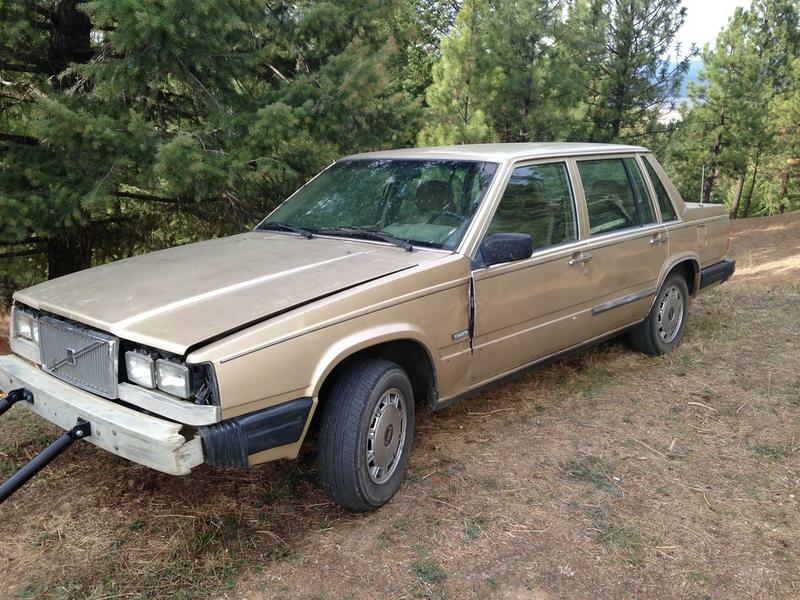 They are getting harder to find for cheap; volvos are cool again amongst the hipster crowd. If I do find one, it will be some fairly easy "plug and play" changes with my wiring harness. This engine will be used until I find the one I want, or if it has plenty of power I might just leave it. Double the power over the flat head is quite a jump!